Spring means PROM Season! 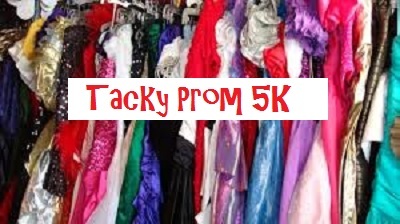 And that means it is time for our 3rd Annual ‘Tacky Prom’ Free 5K in the TriCycle and Run Fun Run Series! That’s right, we will be running in dresses, sequins, suits, hats…but we don’t recommend high heels! So….go dig through your parents (or your grandparents) closets, and find the tackiest of dresses or suits to wear as you join us for this FUN RUN on Sunday, May 13 2018! Check the thrift stores, check the local consignment shops….but remember you should be able to RUN in whatever you decide to wear! Did you know that May is Melanoma Awareness Month? And as such, we will be collecting sunscreen to be donated to the local watermen community immediately following the event. Those that serve to fill our tables with nature’s bounty day in and day out are exposed to the sun on a daily basis. Many of those that head out on the Chesapeake Bay and it’s tributaries to make their livelihood have already suffered the sun’s effects and have been treated for melanoma. Many are still in danger of the sun’s brutal attack. Join us in helping give back to the community and grab a can or a bottle to donate!